from 3 pcs. 6,72 EUR ea. from 10 pcs. 5,96 EUR ea. from 20 pcs. 5,59 EUR ea. from 40 pcs. 5,26 EUR ea. 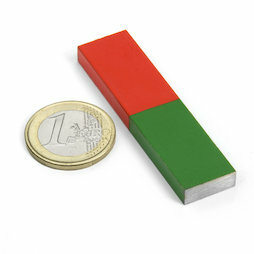 The small AlNiCo bar is 60 mm x 15 mm x 6 mm big and red-green coated. 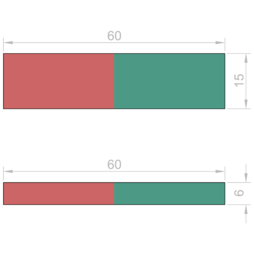 The poles lie on the small areas with 15 mm x 6 mm, the north pole is located on the red end. This magnet is suitable to demonstrate the magnetic field of an oblong magnet.